For the last few years, I’ve been growing a different kind of squash that combines the eating and keeping qualities of both winter squash and pie pumpkin. It’s an heirloom called Pennsylvania Dutch Crookneck Squash, but more commonly called a ‘neck pumpkin’ by it’s many fans. And you can definitely count me as a fan! This squash resembles a butternut squash on steroids, with smooth tan skin and a long meaty neck that can either be straight or curved. The blossom end bulges out into a bulb shape that contains the seed cavity. They are excellent keepers, and the fine grained flesh is great for pies, soups and side dishes. The squash can grow up to 20 pounds in size, but mine have been running more in the 3 to 6 pound range. The three squash in the below photo weighed almost 16 pounds, with the largest coming in right at 6 pounds. The vines are vigorous and rambling, so this plant is not for small gardens or growing in containers. This Cucurbita moschata variety is resistant to squash vine borers, and seems to be unaffected by the bacterial wilt that affects so many of my squashes every year. And it has held up well in our drought this year, getting by with minimal watering. In other words, it’s a tough plant for tough conditions, which makes it a real keeper in my book. To prepare the squash for pie, it can be baked, steamed or cooked in a kettle. I like to cut it into pieces and then bake it in the oven. Once done, the flesh can be scooped away from the skin and pureed. The puree can then be frozen for later use. Please note it is not recommended to can mashed or pureed pumpkin any more. It looks like we will have a total of 7 neck pumpkins this year, weighing in probably around 28 pounds. Last year we had about 7 pounds of them, so we have quadrupled our harvest this year. Since we have so many – more than we could possibly use for pies or breads, I will be trying them out in recipes that call for butternut squash, like ravioli for instance. Like butternut squash, the flavor improves with storage, so I will wait a bit before processing any of these. I won’t be saving seeds from this years crop though, since I did nothing to isolate the blooms from all the other squashes we had growing. Seeds are available from several sources, including Seeds Savers Exchange, Reimer Seeds, and Baker Creek Heirloom Seeds (where I got mine). If you want to see bumper crops from other gardeners around the world, visit Daphne’s Dandelions, host of the Harvest Monday series. And Happy Growing to you all! This entry was posted in Food, Gardening and tagged pies, pumpkin, winter squash. Bookmark the permalink. 26 Responses to It’s Pumpkin Time! Those remind me of the Tromboncinnos that I’m growing. Except they can be summer squash when young, then winter squash when they are older. I haven’t tried them as winter squash yet, so that will be new. But they get a light tan like butternut so hoping they will have a similar flavor. The vines tho are totally huge, running 15-20 feet or more…. Beautiful! The Happy Yummy Sweet and Hot Peppers you sent me are growing huge and putting out tons of beautiful peppers. Thank you! Beautiful squash! I am always jealous of anyone who has a good winter squash harvest! You have to love a vegetable plant that produces such good food (and quite a nice amount of it) and yet is drought, disease, and pest resistant too. That’s a keeper for sure! Very interesting looking pumpkins. I tried growing 3 varieties this year but with the help of my neighbors and deer destroying them I so far only have 1 tiny pumpkin. What does this one taste like? They taste very much like butternut squash to me. What a crook on those squash! Must make for interesting contortions to peel it. I like to make butternut squash soup with parsnips. I bet those would work just as well. I grew those one year, but they never matured. It was the summer that was so cold in 2009. A lot of squash didn’t make it that year. I suppose I should have tried it again, but for some reason I never did. They seemed to thrive in our heat this year, so it’s possible they prefer the heat to cooler conditions. Thanks for all the info! Enjoy! Who squash already. Mine are just starting to set. Mostly male blossoms this year. The 6 pounder looks great. I grew that squash last year. I had tried a slice grown in the garden where I volunteer and it was great tasting. But after growing it myself, and storing it for 6 months, it had no flavor. So don’t store it too long. I was thinking more like a month or two. But thanks for the info! Those are prefect looking, large squash! I’ve never had roasted squash before, I have to give it a try! How many vines did it take to get that many squash? I had two vines. One had three squash, the other had four. I gave them a nice shovel of compost before planting, and that was the only fertilizing they got. I was happy with the results, and I sure got my money’s worth out of that packet of seeds! The squash look very nice. I much prefer squash pie over pumpkin pie and that is what I make unless I get strong requests from the family for pumpkin. The taste is milder than pumpkin and it is lighter colored and I think makes a more attractive pie. You’re right, it is a milder taste. This tastes better than any pumpkin I ever grew. Plus it isn’t stringy like some squashes and pumpkins. I will have to look into those seeds. They look great! I didn’t grow much of any squash this year, the squash bugs and SVBs were just killing me! Maybe I will try this one next year! Beautiful! I won’t be harvesting any winter squash this year since I never got around to planting any. I’m looking forward to seeing what you cook up with those beauties. Wow they look great!! We are struggling with all of our winter squash. We lost our butternut squash to a wilt and most of our sugar pumpkins to the same wilt. The only thing still growing well are the jack-o-lantern pumpkins and they are only good for the seeds. The rest we just feed to the chickens. Very impressive! I fear our tiny urban garden is too small for squash of any kind. Thanks for introducing me to this new, beautiful variety of squash — I’ll now be on the lookout for it! 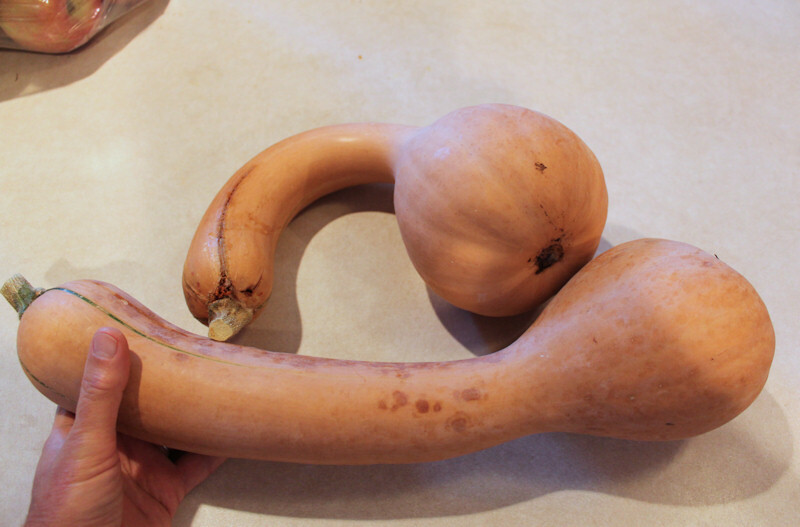 I’m sincerely looking for the right squash for us. Spaghetti squash is a no brainer; but the problem with butternut (which we’ll have tons of this year)s that it’s so, so rich in recipes. I’m very interested to hear how the variety you’re describing turns out in recipes. Please keep us posted. We’re going to try it next year. Have you saved seeds? We’re saving seeds from the spinach seeds you sent us and also from tomatoes and peppers from others. We’d be glad to share what we have. Please just let us know!